After a thorough wash, apply a good quality polish and wax to your Corvette's paint. Contrary to popular belief, there is a difference between a polish and a wax. A polish (also known as "glaze") contains a small amount of abrasives that actually remove a thin layer of clear coat or paint off the surface. Some manufacturers include oils and nutrients in their polishes that they claim help to nourish the paint and prevent oxidation from occurring. A wax does not contain any abrasives and seals the paint therefore protecting your Corvette's finish. It provides a protective layer to prevent exposure to the elements and related fallout. A good rule of thumb is to apply a coat of polish and then seal that with one or two coats of wax. Meguiars, 3M Car Care Products and Zaino are just a few examples of high quality paint care products that are popular among Corvette owners. For applying and removing the wax and polish, make sure to use 100% cotton terrycloth hand towels that are made in the United States. Although the manufacturer tags on some hand towels will indicate that they are made of 100% cotton, some foreign countries have different regulations when it comes to the amount of cotton and other fibers used in the composition of their towels. These other fibers, such as polyester can leave tiny scratches in the clear coat. In order to keep your polishing towels clean, do not use laundry detergents or fabric softeners. Even though your towels may feel nice and soft, fabric softeners contain oils that give them that soft touch. When applied to your Corvette's finish, these oils can leave a milky, cloudy haze on the surface of the paint. This oily layer smears easily when wiped and proves difficult to remove without the use of a "paint cleaner". Keep in mind that a lot of laundry detergents come with fabric softeners mixed in, so make sure you read the ingredients prior to use. 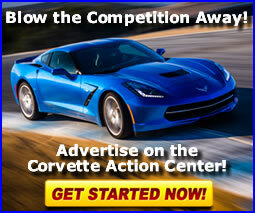 Another frequently overlooked area to prepare is the exterior trim components of your Corvette. These include, weather-stripping, door hinges, hood latches and release pawls, pivots, and spring anchors. For the weather-stripping, use a non-solvent based, silicone lubricant or grease. Mequiars Vinyl and Rubber Cleaner and Conditioner is one example and GM Goodwrench Dielectric Silicone Grease (part no. 12345579) is another. If you choose to use the silicone grease, apply a small amount to the weather-stripping using your fingers. Wipe off any excess with a clean rag. For the door hinges, hood latches and related hardware, use Lubriplate Lubricant (GM part no. 12346293). This is similar to white lithium grease which can be applied using your fingers. If you can't find this product at your local Chevrolet parts department, try GM SuperLube (GM part no. 12346241). This lubricant is similar to WD-40 and contains teflon. The cleanliness of your Corvette's interior is just as important as the exterior prior to long-term storage. The most important parts of your interior are the leather surfaces. These usually consist of the seats, steering wheel, shifter knob and boot. During the summer, leather surfaces tend to become very hot during extended periods of sun exposure. As a result, you're bound to sweat a little when you first sit down in your Corvette. Sweat is very acidic and over time, can prematurely age your leather seating surfaces if they go untreated. That's why it's important to choose a high quality leather cleaner and/or conditioner for the leather components of the interior. Several companies, including Meguiars and Lexol, make excellent products that are easy to apply and most of these can be found in your local automotive supply store. Make sure you read the directions that come with each product before use. To prevent moisture buildup and possible mold formation on interior components, you may want to consider adding desiccant (a chemical that removes moisture from the air) to various parts of your interior. Companies such as Beach Filter Products, Inc., Ecklers Corvette Parts and Accessories, and MidAmerica Designs, Inc supply special pouches of desiccant that can easily be placed in foot wells, seats and rear cargo hatch areas. For more information on properly treating your interior, take a look at our article on the Maintenance of Vinyl, Leather, Plastic, and Rubber Surfaces.